“You don’t need an allotment or even a garden to grow your own..” – Signed by the author! From the author of one of the UK’s best selling gardening books, this book covers all you need to know to successfully grow in containers, window boxes or even hanging baskets. If you do have a small garden, it tells you how to get the most from it. We’ve not always had the benefit of an allotment or even a garden but we’ve always grown our own. This book tells you what you can achieve and how to do it even if all you have is a balcony. This simple, straightforward guide, written in plain English with black and white illustrations, is not designed for the coffee table. It’s a manual to help those who really want to provide something for the table by their own efforts but are limited by lack of space. The trick to maximising production from small spaces and pots. 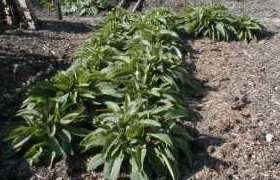 What composts are best to grow different types of plants, how to adapt commercial composts and how to make your own, of course. When it makes sense to grow from seed and when you might be better off buying in plants. What to buy and from where. Some guidance on what tools you may and may not need. Ways to ensure your plants are watered even if you’re not there for the weekend. A list of vegetables, their suitability for growing in containers or small spaces and best methods for each one. As with vegetables but covering fruit. You’ll be surprised to find some fruits are better grown in containers even if you have a large garden. List of herbs, how and where to grow them. Includes those suitable for growing indoors in the kitchen. A comprehensive index so you can look things up easily. 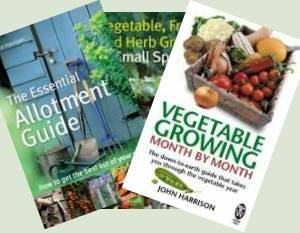 I don’t have an allotment but have always wanted to grow my own fruit, veg and herbs. 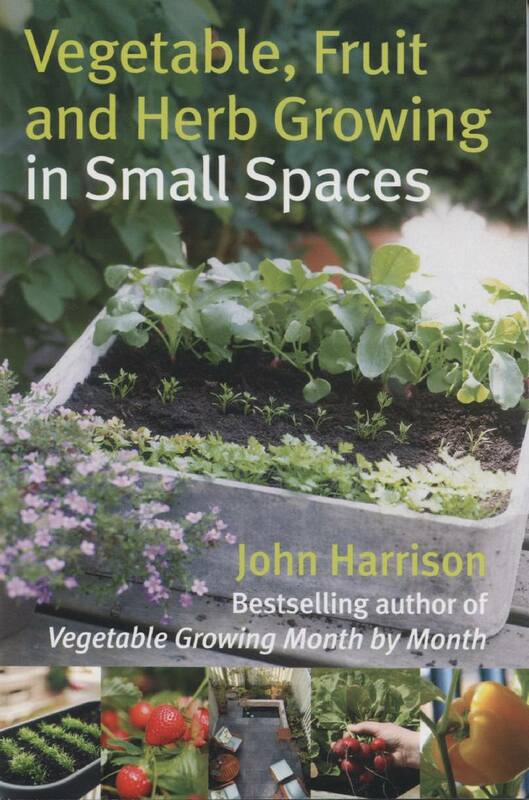 This book is brilliant to show that you can grow practically anything in almost any type of container – from sinks to hanging baskets, in borders or wrapped around a pergola. What did surprise me was the variety of veg that are happy in containers – things like turnips and leeks or better still my favourite – beetroot. There is a whole chapter on herbs which would be a great help to anybody who likes cooking (never knew before that I could grow my own lemon grass!). It covers pests and diseases as well as tools all written in a simple to understand format. I bought three books about container planting and this little book is easily the best. I’ve got v interested in growing veg and herbs in containers, and this book has given me lots of inspirational ideas and tips. Just what I wanted. The author really does cover the topic in a focused, friendly and accessible way. “Small spaces” are just that rather than a garden not quite big enough for an orchard. He indicates what’s worth growing, what’s not and why. He discusses seeds v plants. There’s a very useful table on how long various seeds last and how long they take to germinate, so you know when it’s time to give up on a planting.